Rittz’s The Life And Times Of Jonny Valiant is enjoying a great first day on the charts by already landing in the top three of the iTunes Hip Hop chart and top ten of the iTunes overall music chart. Will Rittz snag the top spot in hip hop and make it to the top five of the pops? If there’s one thing that we can learn from Rittz so far, it’s that anything is possible. Slumerican and Strange: let’s make it happen! 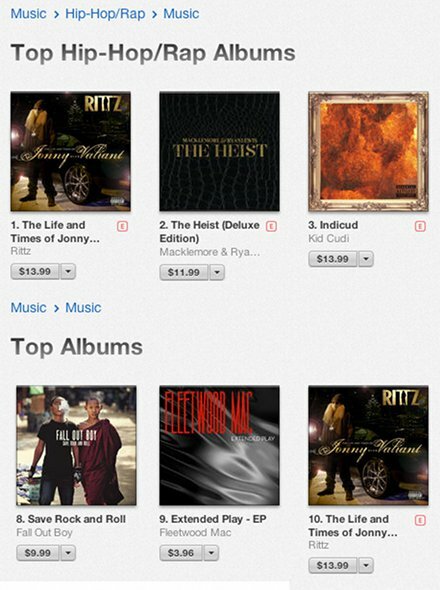 Rittz has reached the top of the iTunes hip hop charts and the top ten overall! What were your expectations for the chart success of The Life And Times Of Jonny Valiant?